I’m always on the hunt for the “next amazing” beauty product. I’m not sure why I’m always on the hunt, but I think it has to do with the fact that I’m getting older (just turned 43 this month) and some of my tried-and-true products aren’t working as well as they used to. Skin changes with age, unfortunately. I’ve been a die-hard fan of Cover Girl Lashblast Mascara for the past five years. It’s always on my yearly “Drugstore Beauty Products Must-Buy List” … but lately, it hasn’t been performing as well as it had in the past. My lashes have been thinning over the past year. So while the CoverGirl did a great job of not smudging during the day, it was lacking the making my lashes “longer” and “thicker” requirement. So when Target asked me to review the new L’Oreal Paris Lash Paradise Mascara, I figured I’d give it a shot. According to the box, this mascara was supposed to increase volume and length (in consumer tests 91% saw intense + volumized lashes; 98% saw lengthening effect; 87% saw more beautiful lashes). But, boxes have said all kinds of crazy things before … I needed to try it and see if this was the best mascara for thicker, longer lashes. The proof is in the selfie, right? Gang … this is only one coat. IMAGINE if I had put on two or three coats?? It would be like wearing false eyelashes, but NOT wearing false eyelashes. I do believe I’ve found the best mascara for thicker, longer lashes for this 40+ year old. Plus, the mascara is available at your friendly, neighborhood Target store (you know, the one we go to once a week) for $8.99 and there is a $1 off any purchase coupon that can save you another buck. You can print the coupon off by clicking the image below. And, because I know that you love Target as much as I do…I would suggest that you attend the #LOrealxTarget Twitter party at 10AM PT on Tuesday, August 1st. They will be chatting-it-up about beauty tips and they will be giving away $500 in Target gift cards. (And don’t even try and tell me that you couldn’t find $500 of stuff in Target that you would want to buy.) 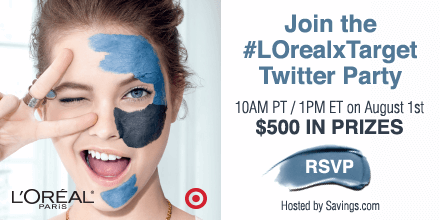 RSVP to the #LOrealxTarget Twitter party –> HERE. Finally, because I always like to keep it real…Target had me try out several of these new L’Oreal products (see below) and I also really, really loved the L’Oreal Paris Pure Clay Mask. There are four versions of the mask…Purify and Mattify, Clear and Comfort, Detox and Brighten, and Exfoliate and Refine. I chose the Detox and Brighten Mask. For years, I have used GlamGlow YOUTHMUD and I have to say that this mask did as well for about a sixth of the price. You can also pick up the L’Oreal Paris Pure Clay Mask at Target with the coupons below. If you try out either of the L’Oreal Paris Lash Paradise Mascara or L’Oreal Paris Pure Clay Mask, let me know. I’d love to hear if you loved the products as much as me. Disclosure: Savings.com, Target, and L’Oreal are a partner of RedefinedMom. However, the written remarks and opinions are entirely my own. Want more information – check out my full disclosure statement. While I’m not quite 40, but thisclose, one of my favorites has been the L’Oreal Voluminous Million Lashes in the waterproof version. It’s pretty amazing stuff and think I’ll switch back to it after using Benefit They’re Real, which I’ve been using for years. On the mascara, I have sensitive eyes. Do you think this will cause a problem?